Lifelong Painful Knees Now Feel Great! When I was young, I did a lot of barrel racing. One time we were racing around a barrel and my horse slipped; the two of us lay on the ground awhile, and when we got up, my knee hurt a lot. It was the size of a basketball for quite awhile, and gave me trouble over the next decades. As the years went by, both my knees hurt more and more. I went to the doctor, and he gave me a bunch of drugs and pain killers, but i did not take them since they made me feel bad. He said I would need knee replacements in the next ten years or so. About a year ago, I was telling my friend Annie that I would like to lose a few pounds. 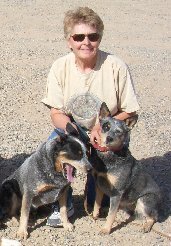 I have been showing my Australian Cattle Dogs at Dog Agility for many years, and the more I ran, the more my knees hurt. I knew that losing some pounds would help. Annie recommended the Inch Loss Program and I lost nearly 40 lbs! She also recommended that I give my dogs some joint complex, and I took some two. Within two weeks, my knees were remarkably better! Today I am nearly pain-free, my knees are feeling better than they have felt most of my life, and being at my ideal weight has helped all aspects of my health.